Four new faces took the Chequered Flag first at the penultimate round of the Rotax Pro Tour National karting series at Puckapunyal in Victoria, including the third female competitor to secure a major race win in the category during 2017. Paige Raddatz converted heat race speed into a final victory in the Junior Max Trophy category. It is her first major National level victory after competing at this level for a number of years. She had to work her way from the second row of the grid and close down on early race leader Angus Wallace to take the lead. She was under extreme pressure from Wallace and Jonathan Marcusson to hold onto the win in the Intrepid single-make chassis class, but showed maturity beyond her years on the wet racetrack to hold on and secure the win. Marcusson was second and series leader, Russell Mayo ended up coming home third. Jac Preston has been towards the front of the Rotax Pro Tour all season long, however has been unable to crack it for a final victory. That changed today for the Gold Coaster – who won his first State Championship in Junior Max. He got to the front early in the 20-lap final and hung tough on a damp but drying track. Series leader, Harrison Hoey in his CompKart was closing down on the Blastology Kosmic racer, however a determined Preston kept his cool to take his first Pro Tour round win. Hoey took second with Lucas Lichtenberger bringing his Tony Kart home for a first Pro Tour podium. Former Junior star, Cody Bewczynski has been looking for form all season long in Rotax Light. The Sydney-based Velocity Kartshop CompKart racer has been on the money throughout the weekend, none moreso than in today’s competition. The wet conditions played into Brewczynski’s hand, comprehensively winning this morning’s Pre-Final and then going on to dominate the final this afternoon. He crossed the line in excess of 11 seconds ahead of fellow New South Welshman, Cameron Longmore. Whilst Brewczynski’s points haul was strong in the Race to the World Finals, another to impress was Newcastle’s Jordan Pike. Like the winner, Pike is in with a shot at making Team Australia and he grafted hard to finish on the podium in third aboard his FA Kart. Series leader Brad Jenner had a challenging day after dominating yesterday’s proceedings and recovered to finish the final fifth. The fourth new winner of the weekend was Jake Rutkowski in Micro Max. Rutkowski has been in a points battle with Harry Arnett throughout the course of the season and the EVOKart driver made every post a winner today in ensuring the only Team Australia place for Micro Max will go down to the last round of the Rotax Pro Tour at Albury over the weekend of September 15-17. Rutkowski took the Pre-Final on the final lap when the damp conditions caught out Shamick Racing driver Arnett. Come the final, Rutkowski didn’t look like being beaten getting to the front off the start and then staging a dominant display to pull away from Arnett. Local driver Kristian Janev continued his positive development in the youngest category of the Rotax Pro Tour finishing in third position. Kris Walton’s double duty decision looked to have unfurled this morning in Rotax Heavy when he suffered a mechanical issue in Rotax Heavy, only to have a similar problem afflict him in DD2 Masters’ Pre-Final. This would necessitate that the Z Force CompKart driver would be forced to the rear of the grid for both Finals. In the first one – Rotax Heavy – he pushed through the field, and got himself into second, getting past the returning Lane Moore’s CRG. This set up a nine lap duel with his season long nemesis, Chris Farkas. 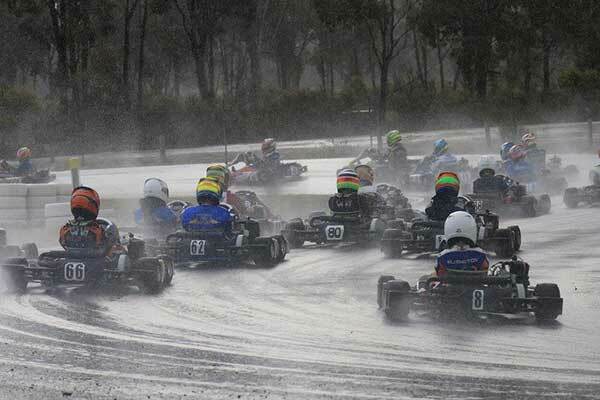 The Tony Kart driver, also from Queensland, had established a lead in excess of three seconds over Moore. With the advantage of wet MOJO tyres that hadn’t completed the Pre-Final, Walton set about pumping in some quick times and was under one second from Farkas with two laps to go. Despite throwing everything at the track and the conditions, Walton was unable to get onto racing terms with Farkas on the last lap and had to be content for second behind Farkas who took yet another stunning Pro Tour win. Moore on return looked solid to finish third. The very next race, Walton came out of the blocks fighting and was soon embroiled in a fight that involved the major contenders for the DD2 Masters seats in Team Australia – Scott Howard, Troy Woolston and Troy Bretherton, along with Michael Patrizi for good measure. Making short work of most of the field, Walton closed down on the leaders and it didn’t take him long to clear both Bretherton and Howard to take the lead. Once into the lead, he opened a small advantage. Woolston worked his way to second and would hold that until the chequered flag, whilst Howard would come home third in front of Patrizi’s Ricciardo Kart. Bretherton, despite leading the early stages lost speed in the final stanza of the race and dropped back to sixth placing. 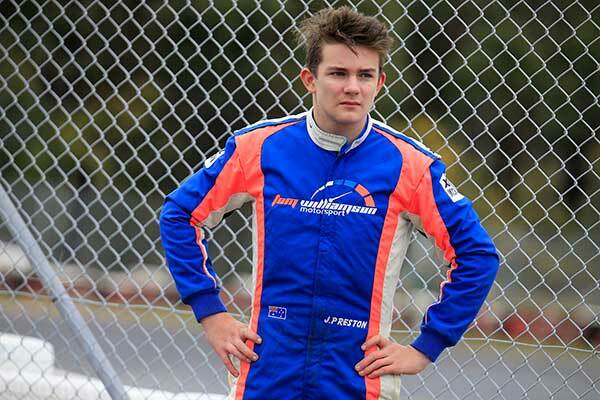 DD2 proved to be a thrilling fight and young Queenslander, Ryan Kennedy was able to get the race win. He’d been through a crazed Pre-Final with a number of competitors getting in front of him then going off track opening the win up for him. It was the same in the final. Cody Gillis got to the front and the pair engaged in a fight for the lead that almost boiled over at one point. Gillis got a wheel off on the dirt into turn one and the pair touched, with Gillis dropping back some places. Officials post race deemed there was nothing to answer allowing Kennedy to secure the win. Second was TWM Kosmic racer, Joshua Fife. Fife worked his way through from 10th on the grid and was quickly among the front runners. His blistering lap times put him into a podium position, however he wasn’t close enough to mount a serious challenge to Kennedy. Kiwi, Josh Drysdale drove his GP Kart to third placing overall after being involved in the fight for most of the weekend. Shamick Racing’s James Wharton’s solid performance in the Mini Max category continued and once again he dominated the category, all but securing his place for Team Australia. He quickly got into the lead and established a gap on the field. The fight through the field though was one worth watching, with any number of competitors in line to take a podium position. New South Wales Scuderia PCR driver, Cody Maynes-Rutty perhaps put in one of the drives of the day after starting deep in the field and working his way forward. He ended up crossing the line in third position, however a post race technical infringement for the competitor that finished second elevated him up one spot and also brought Ipswich round winner – Praga racer Hugh Barter – up to the final spot on the podium. Despite the rain squalls and heavy winds that at times descended on the Hume International Raceway across the weekend, the racing from all classes was terrific right throughout. The stage for the Race to Portugal is seriously set for a phenomenal weekend at Albury-Wodonga Kart Club over the weekend of September 15-17. Almost every class is still in limbo with the final places to be decided by the final at Albury. The Sunday evening of the Albury-Wodonga weekend, which will double as the annual Jason Richards Memorial, will see the Series Champions crowned, along with Team Australia and the Australian Team Captain announced on the night. Full details of that will be made available next week.